There is no fiscal cliff and Erskine Bowles helped to create it. Yes, the title is a wee paradoxical, but so is the logic behind the so called ‘fiscal cliff.’ A little history: the term ‘fiscal cliff’ was first used this year by Fed Chairman Ben Bernanke when he warned of a “massive fiscal cliff of large spending cuts and tax increases” that would hit us on January 1, 2013 due to a deal cut by Republicans and Democrats to raise the debt limit last year. But, as Paul Krugman has suggested, contrary to the way it’s often portrayed, the looming prospect of spending cuts and tax increases isn’t really a fiscal crisis. It is, instead, a political crisis brought on by the Republican’s attempt to take the economy hostage. So now, on January 1, about $400 billion in tax increases and $200 billion in spending cuts will take effect. That’s $600 billion, or 4 percent of GDP, and that—everyone agrees– would be a drag on the economy. Like most economists, Bernanke thinks that serious budget reduction in the middle of a recession / depression is a bad idea. In fact, turns out MOST rational people on Earth think budget reduction in the middle of a recession is a bad idea, too. Except folks who have another dog in the hunt, folks who aren’t so much interested in deficit reduction as they are in so called ‘entitlement reform’ (that would ultimately translate into the privatization of Social Security) and corporate tax relief; folks like Erskine Bowles. 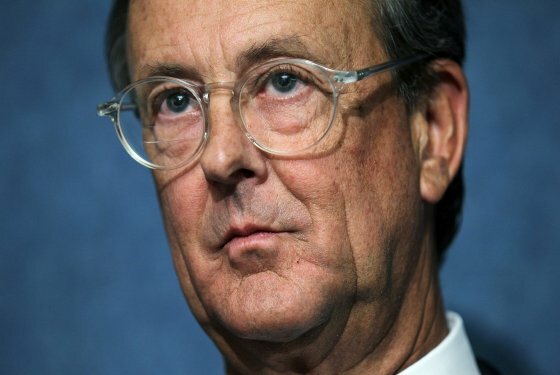 Here’s something we need to understand –there is a Wall Street Wing of the Democratic party, and one of its most eager representatives is Erskine Bowles. According to Bill Black, noted economist and blogger at Naked Capitalism, Bowles along with Alan Simpson is allied with Republican Wall Street billionaire Pete Peterson who has pledged a billion dollars in the effort to privatize Social Security called “The Third Way”. But here’s the thing. The safety net is no threat to America. The great threat to America is gutting our safety net, or, to put it more simply, the Third Way itself. So here’s how this could play out. On January 1, the Bush tax cuts disappear and everyone’s taxes automatically revert to the higher Clinton-era rates. At that point, the conversation changes: Suddenly we’ll be talking about cutting taxes on the middle class and maintaining them where they are now on the rich. And Obama can basically go on TV every single day and say that he’s ready to sign a middle-class tax cut any time, but Republicans are refusing to agree unless their rich pals also get a tax cut. Exit polls show that the public—both Democrats and Republicans– DO NOT want to give the rich a tax cut, and they are going to be angry that the GOP is holding their tax cut hostage unless Donald Trump gets a tax cut too. So there’s no real reason to fear the fiscal cliff, at least not in the short term, unless, of course, you listen to the loud drum beating by folks like Erskine Bowles who recently wrote a hand wringing op-ed in the Washington Post deeply concerned about jumping off the cliff. Some of this simply isn’t true—the cuts would not be immediate. They would be gradual. The tax increase wouldn’t be paid until taxes were due and much could change—in fact would change— if the political calculus is handled correctly. The double-dip recession isn’t likely to occur, again, unless the Republicans remain intransigent on tax cuts for the middle class—which would be political suicide. But even if Bowls hyped paranoia was the case, why not simply punt on the fiscal cliff and continuing to add to the debt? Who exactly says the debt is such a great problem that it has to be dealt with NOW in the middle of a recession? Not Ben Bernanke. Not Paul Krugman. Not Joe Stiglitz. Not Bill Black. Not the vast majority of respected economists out there. Not anyone I know of reasonable intelligence. In fact, it’s only Erskine Bowls and his Wall Street buddies that think this is so important it has to be tackled right now. Did you catch that? The ‘markets’ –that is Wall Street brokers– might get nervous. I’m wondering at this point, how many friends in the broader community these Wall Street brokers currently have. One suspects Bowles has an interest in shading the truth. He was an investment banker before he entered politics, and he currently serves on the board of directors for both Morgan Stanley and GE. He was chief of staff under Clinton from January 1997 to October 1998, during which time he tried to broker a deal on Social Security with Newt Gingrich and would have succeeded if it weren’t for the Lewinsky affair. Opening up a grand bargain on what he refers to incorrectly as ‘entitlements’ is one of the fevered dreams of Wall Street denizens—and Erskine Bowles, both for profit and personal legacy. So Erskine may not be exactly impartial on this matter. Got that? Accept Bush tax cut for another year on the promise of ‘being open to… new revenue’ from….somewhere…but where? Apparently, that’s to be figured out later. Sounds like quite the bargain. But, in his own way, Bowles is certainly an opportunist, if not a political hit man. He’s a close friend of Peter Peterson, and the entire Third Way movement see him as key. That’s exactly the person you don’t want in office, or anywhere near these negotiations. One of the most important reasons why more Americans support the Democratic Party than the Republican Party is the conventional wisdom that the Democrats guard our social safety net. If Obama and the Democrats, led by the likes of Erskine Bowles or other so called ‘centrist’ offer a grand bargain in which paid benefits programs like Social Security are in play it will be more than a political disaster; it will amount to a betrayal of all those who have elected him. The only people who win in such a ‘grand bargain’ are the denizens of Wall Street and their Third Way lackeys. I shall watch with interest as Obama battles with the Republicans on this. As a Brit, I don’t know what these Clinton-era rates actually are, though. Could you enlighten me?